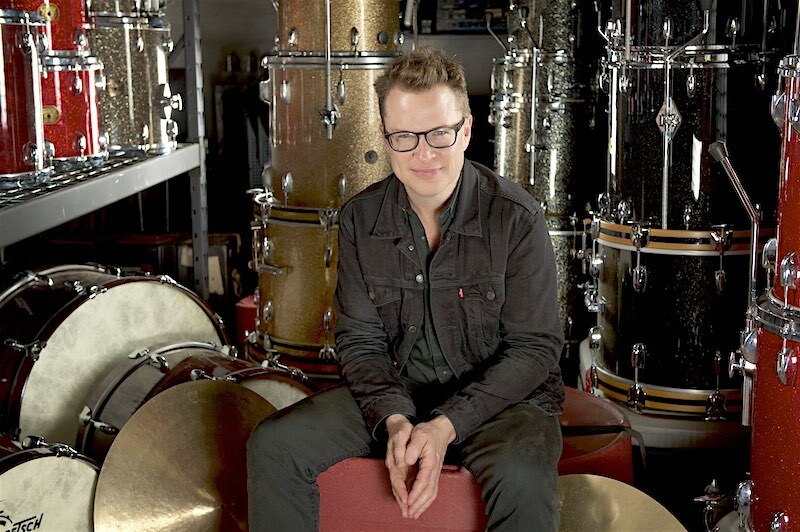 Stanton Moore is well known not just for being a founding member of New Orleans based jazz-funk band Galactic, but also for his vivid solo career, which has expanded well beyond the borders of his hometown, New Orleans. While releasing multiple solo records, and working with his own trio, Moore has also found time to branch out into the educational sector. 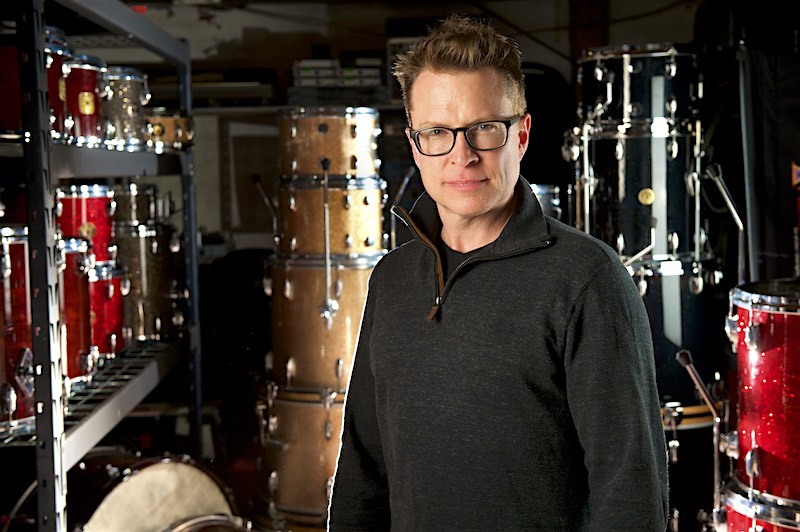 Multiple books, DVDs, clinic tours and drum camps have developed into the highly successfully Stanton Moore Drum Academy. I caught up with Stanton via Skype to chat about his upbringing in The Big Easy, his online Academy and his brand new album ‘With You In Mind’. You grew up in New Orleans. That must have been amazing. Tell me about the music surrounding you there. My mum started taking me to Mardi Gras parades when I was eight months old, so I was exposed to the marching bands and all that at a very young age. I do remember coming home at the age of maybe three or four and hitting on pots, pans and Tupperware. My dad would play all the Mardi Gras music on the stereo: The Meters, Professor Longhair, Dr. John, The Wild Magnolia Indians and all that. My family was not necessarily a musical family other than we were surrounded by music all the time by my parents. I knew by the age of five or six that I was really interested in drums. My parents let me take piano lessons first and then told me if I’d do well and keep my grades up, I could have a snare drum. Next they got me a drum set and once I got that, piano fell away. I think I was 11 or 12 then. I fell in love with it but didn’t get serious until I got into high school where I had a really great teacher by the name of Marty Hurley who taught me all the rudimental stuff. Once I got into college I started studying with Johnny Vidacovich who really taught me how to loosen up because Marty has a very regimented approach. It’s quite a military approach to drumming, isn’t it? A million percent, yes. Marty Hurley was a huge presence in the the whole Drum Corps World. He was the director of the drum line for Phantom Regiment which in the United States is a big Drum Corps. So you mainly had lessons in school? Yeah. My parents asked me where I wanted to go to high school and I just wanted to go to the school with the best drum line. That turned out to be Brother Martin High School and we later figured out it was because of Marty Hurley. Was that the time you got into jazz too? I got into jazz when I was about 17. I started realising that if I wanted to be a better drummer I should check out jazz. I really fell in love with it and played jazz a lot, especially during college. I started getting a lot of different gigs but then went on the road with Galactic so I never really did anything playing jazz that the general public would have access to. That’s why four years ago I decided to really focus on the jazz side of my playing, create a weekly gig, make a record, start touring it and so on. I just really wanted to create an outlet for myself because I simply wanted to play more jazz. Your main band Galactic has been going since ’94. We started playing together as Galactic Prophylactic in 1992. We then restructured the band in ’94 and brought out our first record in ’96. We’ve been on the road for 21years now. We’re recording songs at the moment and will release some new singles soon. Also I’ve just been working on this new record that’s coming out this week. That was my next question. You’re about to release a new album called ‘With You In Mind’ celebrating the songs of Allen Toussaint. Tell me more about that. It was all a very “in the moment” idea. We had actually been rehearsing and preparing original material to record but then learned of Allen’s passing and decided to just completely go into a different direction. I’m very happy about the way the record came out. We did a lot of post-production, vocal overdubs, percussion overdubs – we really fleshed it out. I don’t think it sounds anything at all like a put together thing. We have Maceo Parker on a couple of tunes as well. I feel very fortunate to have been able to put all these people together for the album. So the original idea of the album was original music by your current trio? It was stuff written by our bass player, he writes a lot of tunes. A bunch of stuff he has done, maybe some James Black stuff and a few other friends of ours. Similar to the ‘Conversations’ record I’ve done. 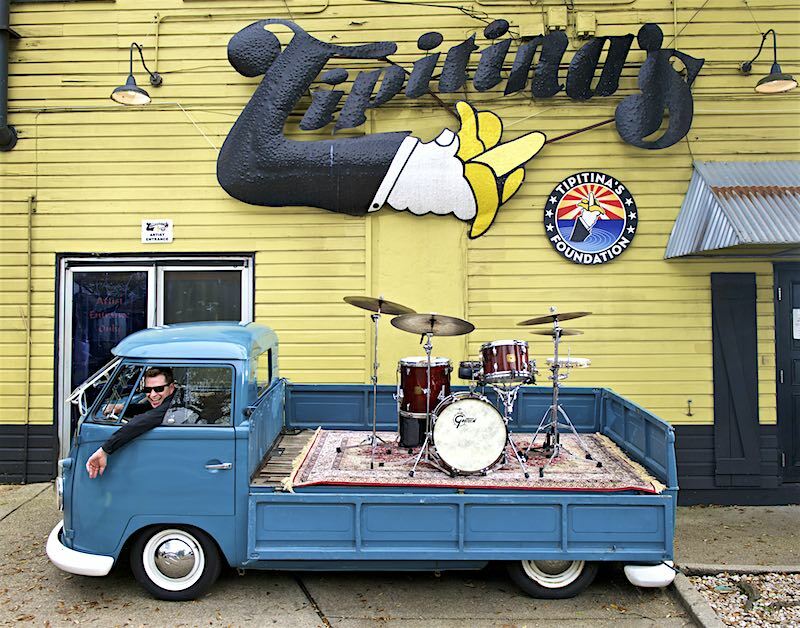 We just wanted to go in and record compositions by friends of ours and New Orleans artists, but changed direction once we heard about Allen passing away. So we can expect another album pretty soon seeing as all the new stuff is prepared already? You seem to often have lots of guests from the New Orleans music scene on your records. Is there a particularly strong musical community there or are you more of an ambassador bringing people together? It’s a little bit of both I think. It’s a very community based music scene, a lot of people know each other and it’s like one big family. It’s great to have access to all these amazing artists (especially singers) and we like drawing from all these amazing artists we have at our disposal. That’s just what I did for this new Allen Toussaint record too. We started thinking we should have vocals on the songs. Who do we call? Let’s ring Cyril (Neville). He came in to sing on a song or two and we just called him back to do lots more. We had Ivan Neville, Erica Falls, Kiki Philips, Nicholas Payton, Donald Harrison Jr., Trombone Shorty, Eric Bloom, Skerik…. Because we changed direction for the album so last minute, we didn’t have time to come up with pre-production, we just kind of did it all in the moment, collaborating together. “What do we want on this song?” “Well let’s call these horn players and this vocalist.” Being here made it all happen. Living in New Orleans is like living in the greatest musical toolbox that you can possibly imagine. You have all these amazing artists at your disposal, so we just started calling them up. You started your solo career in 1998. Was that to find your own musical creative outlet? I just knew, even back then, that I had leanings toward jazz. The producer for Galactic reached out to me and said: “Hey, what would you think about doing a solo record? 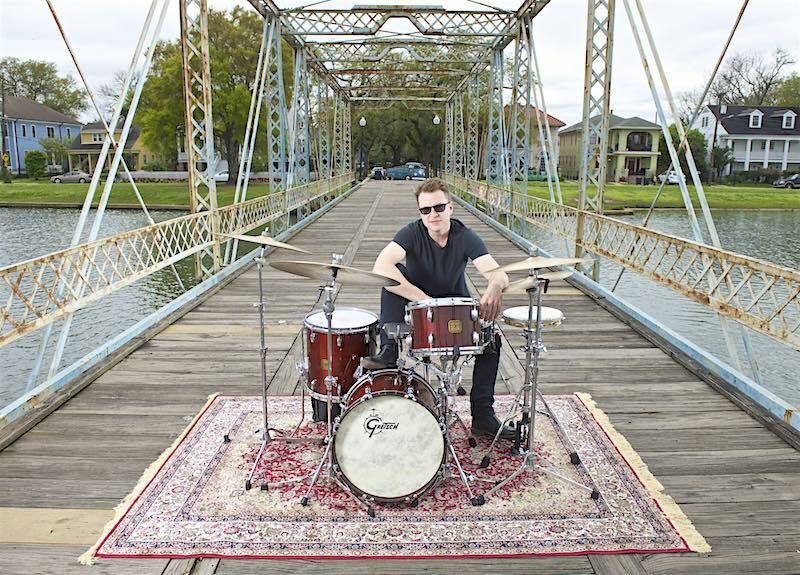 Is there anyone you want to play with?” I had just recently met Charlie Hunter and Skerik and thought it would be fun to get them to play together – I also got some of my New Orleans guys on there as well. It was a fun record to do and that’s how it all started. 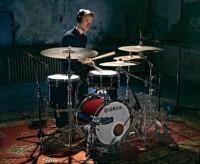 Let’s talk about your online Drum Academy. Has teaching always been a passion of yours? I wouldn’t say that but it has become more of a passion over the last couple of years. 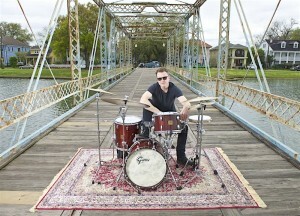 I’ve always been teaching but what really happened was DRUM! magazine here in the States reached out to me and wanted me to write an ongoing column about New Orleans’ second line. I started writing a column every month and started to realise that I had come up with a program to teach myself all this New Orleans second line stuff, so now I just had to write it down and present it to people. I got a lot of positive feedback and realised that maybe I had a knack for explaining stuff in a clear way. After a while of doing that monthly column I was brought to the attention of Sandy Feldstein who approached me and said: I think the way you’re writing is great and if you flesh out these monthly columns, you have chapters. So I started working on my first book. Sandy liked the way the book came out so we did the DVD with it and people really seemed to dig what I was doing. 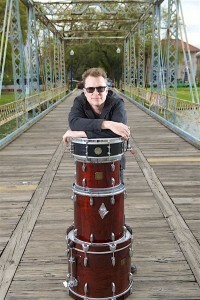 Through all this I started to be brought into some of the drum festivals. Doing more festivals gets you more magazine coverage and so it just all spiralled up and helped to propel my career forward. What really made me passionate about my teaching was when you have somebody come to you and say: What I learned from going through your book really changed my playing, made me a more musical player and I’m enjoying playing gigs much more. To make that connection with people and being able to improve their musical life – and hopefully improve their life in general – that means a lot to me. When you play a gig and you connect with the musicians and the few people you can see from stage, that’s cool, but when you connect with a drummer like this, to me that’s just a much deeper and longer lasting connection. On top of that, to teach and write these things I had to understand what I’m presenting on such a deeper level that it improves my understanding and playing so it became a very symbiotic relation with myself and my students. I’ve really come to love teaching because of all these reasons. It really helps me become a better drummer. Yes, I definitely think it is and this is the next step. I love putting together and presenting the content via videos and books but now it’s just a different delivery model. Instead of having a publisher I’m now self-publishing, put the videos up for streaming and then make PDFs of the notation and the worksheets – basically the book that would accompany the DVD. The last lesson I just released is about 12 minutes long and spreads over nine pages. It’s keeping me super busy because I’m on a deadline all the time. I really dig it though and it seems people are getting a lot out of it. There are currently 34 lessons of ‘The Fresh Approach’ which is written by Mark Wessels and I did the video lessons. All these videos (over nine hours of material) are available for streaming and I’ve just uploaded over 3.5 hours to the part of the website I call the Academy Lessons. For example lesson one is all about the way I developed my buzz rolls, lesson 2 is the blushda, lesson 3 is the drag, then we get into brushes and all these other things I do that people ask me about all the time. I’ve just recorded the next 18 lessons, so yeah, I have a lot of material. There is a forum as well where guys are posting videos and notation that are variations on things I’ve done – and then those variations are giving me ideas. We’re all learning from each other, it’s super cool. Some people even know each other from my camps, others just meet in the forum, it’s all super supportive. Eventually I want to get into streaming live, doing live lessons where I can answer peoples questions directly. It’s going great and the subscribership is growing, but I’m really hoping I will gain some subscribers in the UK as well. It’s all super fun and really exciting for me because right off the bat the forum and the community were very interactive and that was exactly what I was looking for. It’s amazing seeing the amount of progress I’ve achieved in my own playing just by applying that concept. One of my written lessons I’m about to release is actually my thoughts on practising and I’ve recently been asking a lot of people their thoughts on this. I really feel that in a practise session where you only practise one thing you really reach a point of diminishing return after about 15-20 minutes. There was this one thing I was trying to practise and I was about an hour, an hour and a half in. Let’s say I’d started at 80 bpm, I gradually progressed to 90 bpm, made it up to 95 but then it started to get sloppy. So I’m back down to 90, but wait, it’s still sloppy – back down to 80 where I started and it’s still sloppy. I used to get frustrated so much. Then I started to think maybe I’m wasting my time, maybe I should move on to something else and practise that for 15-20 minutes and then over night – ‘sleeping on it’ – your brain has time to process the muscle memory. So now if I hit that wall where it gets sloppy, I stop and move on to something else – and that’s working! So I really have seen the results myself. If you practise slow with a metronome and you play really accurately and cleanly, it gets programmed so much more deeply into your mind and the muscle memory between the mind and the body synthesises on such a deeper level. Sometimes I start stuff at 40 bpm and it’s really hard to play things that slow. What happens is you get better at doing it and if you’re better at playing stuff without any tremors in the force, without any cobwebs then once you start increasing the bpm on a daily basis, before you know it you’re playing it up to tempo and it’s not sloppy. 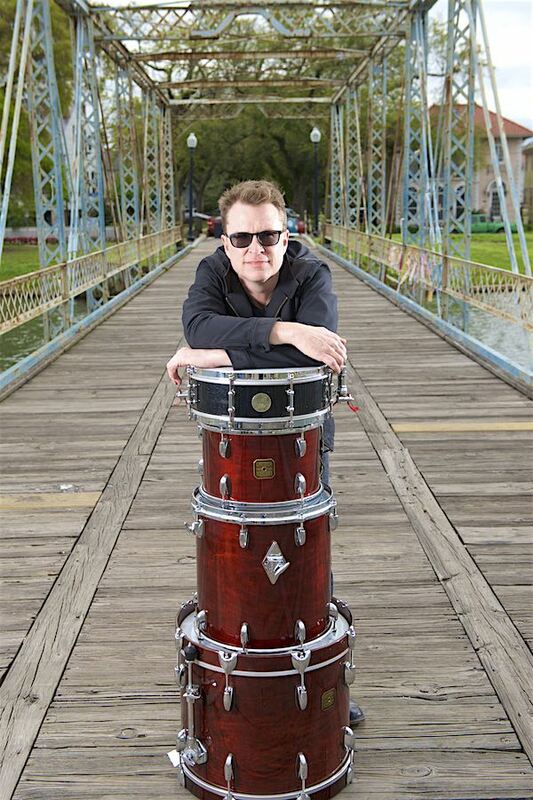 A few years ago you started creating your own signature snare drums. Is this still a project that excites you? Oh yeah, very much so. 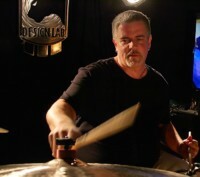 Ronn Dunnett has been making my titanium snare signature for a while now. It’s under the Stanton Moore Drum Company. We have our own badge and all that. We’ve been doing a 14 x 4.5” titanium for years and just recently introduced a 6.5”. Ronn did it with a black sparkle powder coating, sent it over to me and it’s been my main snare since then, I love it. So he’s always experimenting with different materials, different sizes and making variations of my drum which is really exciting. You have also been involved in Crescent Cymbals. Yes, I’ve had the same design of my signature Cymbals with Crescent for years but now Sabian is making them as opposed to other companies we’ve used before. 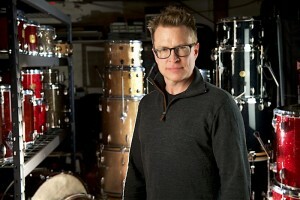 Sabian actually bought Crescent and is gonna do a full roll out of them as the Stanton Moore Collection at January NAMM. I’m very excited. Have you just always been a bit of a gear head? I wouldn’t necessarily call myself a gear head but I am very specific about the sounds I wanna hear. I got approached about the titanium snare drums; I approached LP about creating a pandeiro that could be hit with a stick and integrated into a drum set; Vic Firth approached me regarding my signature stick. So yeah, I’ve just been very fortunate to have been offered several situations got to create the sound I’m looking for. You play quite a unique set up. 20” main kick, 26” side kick, pandeiro – is that all coming back to the roots of Mardi Gras drumming? Yeah, I’m basically trying to blend some of the Mardi Gras Indian stuff which is a lot of tambourine based grooves. That’s why I like the pandeiro, it sounds like a mix between a floor tom and bass drum with jingles. That and also the marching bands. So yeah I’m trying to create a combination of Mardi Gras Indians and marching bands blended together on a drum set. Getting my new record out on Friday (author’s note: the album was released on 21st of July 2017); trying to continue to build the subscribership of the drum academy and hopefully working towards doing some live streaming with the academy too. I also have a four week tour with Galactic coming up at the end of the month and we’re releasing some singles with the them too. So, always a lot of balls in the air. Thanks a lot for your time Stanton!